What is a ‘true’ Christian? There are people today who think they are Christians, but they are not. There are unbelievers who point to the bad behavior of some who claim to be Christians and say, “See, they behave worse than us, why would I want to be like them?” Both of these attitudes are based on a faulty understanding of what it means to be a Christian. Although this article will not be an exhaustive look at the attributes of a Christian, it is meant to motivate one to evaluate, or re-evaluate, one’s life to see if he or she truly understands what it means to make Jesus the Lord of one’s life. The Bible tells us that, “…|all have sinned and fall short of the glory of God” (Romans 3:23 ESV). This means that everyone has sinned against God and is in need of forgiveness. The Bible’s message is clear that God has provided that forgiveness by the life, death, burial, and resurrection of His Son, Jesus Christ (see Matt. 26:28; Mark 1:4, 3:29; Luke 1:77, 24:47; John 20:23; Acts 2:38, 5:31, 10:43, 13:38, 26:18; Ephesians 1:7; Colossians 1:14; Hebrews 9:22, 10:18 for starters). When we trust Jesus as our Lord and Savior, realizing that we cannot do anything to save ourselves, we are forgiven of our sins and enter into a wonderful relationship with the Creator God. There is a struggle in the Christian’s life to always remain submitted to God, His will, and the Holy Spirit’s guidance. However, we are not always successful in this endeavor and sometimes we will sin. It is often said, and rightly so, that there was only one perfect person who ever lived, and His name is Jesus Christ. No matter how much we want to be sinless, oftentimes we do sin. However, even when we sin, our response to that sin determines what effect that sin will have on our walk of faith. If we try to excuse our sin, or if we throw up our hands and believe that we are helpless to resist the temptation to sin, then we will usually grow cold in our relationship to God and will not have the close walk with Him we desire. The Bible assures us that we never have to fall into sin, that God has provided a way to escape temptation (I Corinthians 10:13) and to resist the Devil (James 4:7). We must trust God to rescue us and strengthen us. The Bible tells us that the duty, the basic reason we exist, is to worship God. The clearest biblical definition of worship is found throughout the Old and New Testaments in a form similar to, “And you shall love the Lord your God with all your heart and with all your soul and with all your mind and with all your strength” (Mark 12:30 ESV; see also Deut. 6:5, 11:1, 11:13, 13:3, 30:6; Joshua 22:5, 23:11; Matt. 22:37; Luke 10:27). If one does not have a sincere love for God in his or her heart, one should re-evaluate his or her relationship with God in light of biblical teaching. If one truly believes that the Bible is God’s Word to us, how can we say we love Him if we do not consider His Word vital to our walk of faith? 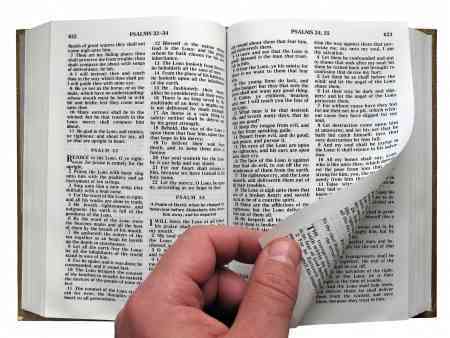 “The sum of your word is truth, and every one of your righteous rules endures forever” (Psalm 119:160 ESV; see also John 17:17). If one does not care what the Bible says, or does not have a love for its content, his or her faith is questionable. If one truly believes that the Bible is God’s Word to us, how can we say we love Him if we do not consider His Word vital to our walk of faith? The ‘true’ Christian realizes that sin is unholy. The Bible is clear that it is sin that separates us from God. We are instructed to avoid evil (I Thessalonians 5:21-22; I John 4:1); therefore, we know that sin and evil have no legitimate place in the life of the Christian. Too many professing Christians do not understand the seriousness of sin; they do not understand how our holy God sees sin. God views sin so seriously that He sent His only Son to die on the cross in order to make a way for us to be freed from it and its effects. Sin separates us from God, it destroys families, lives, nations, and anything else it influences. There is no room for the acceptance or approval of sin in the Christian’s life. The Bible is clear that, “Anyone who does not love does not know God, because God is love” (I John 4:8 ESV, see also John 13:34, 15:12, 17; I John 4:7, 16). Too many times, in current public debates, Christians treat those with whom they disagree in very un-loving ways. No matter how rude, crude, or socially unacceptable our opponents become, we must honor God in our actions and attitudes. We must always treat others with the love that God has graced us with. We must care for others, and treat them with respect, because God first loved us. The Christian has the answer to the question everyone wants answered. There is a hunger in every person’s heart that lets them know that, apart from a saving relationship with Jesus Christ, something is missing in their lives. The Christians knows that the Bread of Life (Jesus Christ) is the only thing that can truly satisfy this hunger. Jesus said, “I am the bread of life; whoever comes to me shall not hunger, and whoever believes in me shall never thirst” (John 6:35 ESV; see also John 6:48). Also, Jesus commanded us, as He did all of His disciples, to, “Go therefore and make disciples of all nations, baptizing them in the name of the Father and of the Son and of the Holy Spirit, teaching them to observe all that I have commanded you. And behold, I am with you always, to the end of the age” (Matthew 28:19-20 ESV). A professing Christian, who has no desire that the Gospel be spread to a lost and hurting world, may not truly be a Christian at all. A ‘true’ Christian is one who has had his or her sins forgiven through a faith relationship with Jesus Christ. We know that Christians aren’t perfect either. Sometimes we fail, sometimes we even willfully sin; however, the Bible tells us that, “If we confess our sins, he is faithful and just to forgive us our sins and to cleanse us from all unrighteousness” (I John 1:9 ESV). God is always willing to forgive us if we come to Him with a truly penitent heart. We have also seen that certain attributes, attitudes, and actions accompany anyone who is truly a saved follower of Jesus Christ. Although not exhaustive, this article should give pause to anyone claiming to be a Christian but who has no love for God or His Word, who does not hate sin, who is not motivated by love, or who does not have the desire to see the Gospel’s message proclaimed. May each of us say, with David, “Search me, O God, and know my heart! Try me and know my thoughts! And see if there be any grievous way in me, and lead me in the way everlasting!” (Psalm 139:23-24 ESV). Thank you Robert for the great article! As you know, this is one of my main concerns about the “church” today. Just because we are in a garage it doesn’t mean that we are a car. Those within the “church” are not necessarily Christians. Your theme is “A True Christian”, and I agree with you that a true Christian exhibits the qualities you have listed, but so do many non-Christians. I would suggest that a person can love God, the Bible and people, be morally upright(hating sin) and actually campaign with the youth group or the “church” on evangelistic out reaches and be totally lost. I have known these people and they have been in my youth group and yours. I also presently know these people and they are Mormons, Jehovah’s Witnesses, and members of your church and mine. It is not enough to love God, hate sin, love the Bible, and love God. It is a peril, and the pews are filled with these lost souls, lulled to sleep by pastors unwilling to tell them the truth. It makes me very angry. I have labored for hours pleading with pastors to preach the truth.They call me intolerant and a blasphemer…honest. If the sinner is not made aware(convicted) by the Holy Spirit, through the preaching of the Word, of their complete brokenness….their utter depravity, and repents, turning towards God in Christ for forgiveness, there is no forgiveness, and no salvation. All else, you have mentioned, flows from this starting point. No starting point…no “True Christian”. Thank you for allowing me to vent. This is one of the few venues where I can. Sorry it took so long to respond, I’ve been a little too busy. I absolutely agree with you. And, really, I think we are saying the same thing…just with different words. You wrote, “All else, you have mentioned, flows from this starting point” and that was one of the main points I attempted to make in my article. The ‘true’ Christian (the man or woman who has realized his or her sinfulness and trusted Jesus Christ for salvation) is the only person who can genuinely possess those characteristics. Now, some may ‘act’ like they love God, hate sin, love the Bible, etc., but it will only be an act. Because, inwardly they do not love God, the Bible, hate sin, etc. Because, one who disobeys God is not one who loves Him; one who discounts the Word of God is not one who loves the Bible; one does not truly hate sin until he or she understands how God sees sin. And certainly, one who merely ‘acts’ the part is not forgiven. Therefore, I think we are both saying the same things, even if we approach the subject from different vantage points. Outwardly, unsaved people can ‘appear’ to be ‘true’ Christians; nevertheless, inwardly they are not. I hope my article has the result of causing many to look inward and reassess their salvation; as Peter wrote, “…to make their calling and election sure” (II Peter 1:10). Doc, I always look forward to your comments. You are always thoughtful and thought-provoking. And I can easily see that you take your relationship with God very seriously and are concerned with the salvation of others. You can vent here anytime. Came across a sermon can John Wesley gave in July 1741 called “The Almost Christian”. In the sermon he writes about the “almost Christian” compared to being altogether “a Christian”. The Christian “loves God”, “loves his neighbor” and “believes in the Son”. It is a sermon – much longer than Mr. Driskoll’s good, short writing. God’s Love is shed abroad in our hearts through the Holy Spirit after salvation(Rom 5:5). Man’s love may be displayed, and is, by many, without any knowledge of being born again. It is a deception for many to think that they are saved by doing good, “Mother Teresa” works and having a form of godliness, displaying their acts of love. True love comes from God and is indeed a hallmark signature of being born again. God is Love. We must not forget the steps to God. They are listed on this site under “Do you know Jesus” at the top of the home page. Repentance…turning from sin, and turning toward Christ is one of the key steps. If you’ve made Jesus the Lord of your life, you have the wrong Jesus and may be in the wrong church. Jesus is already the Lord of your, and everyone else’s life, as everyone will eventually admit (Phil 2:10). Christians realize this now. Instead Jesus calls you to be his disciple, not the other way around. He does this by calling you through the gospel (Romans 10:17) and occasionally combining his word with physical elements, such as ordinary water, wine, and bread. Even though Christ “is” Lord, there remains a “work” for the believer, to set apart or to “make” Jesus Lord, or Ruler(Master), right? Thanks for reading and commenting. Sorry it took so long for me to respond, lot of irons in the fire these days. Let me clarify my statement, “…if he or she truly understands what it means to make Jesus the Lord of one’s life” if I might. While it is true that Jesus is Lord, and everyone will eventually realize and admit that truth, there are many that refuse to allow Him to rule their lives. They reject His lordship and are in wilful rebellion against Him. It might have been clearer if I had written, “…if he or she truly understands what it means to recognize Jesus as the Lord of one’s life and to follow Him”. That was the meaning behind what I wrote. Thanks for allowing me the opportunity to clarify that, Scott. God bless you. I think the context for 1 Pet 3:15 calls us to “set apart” Christ in our hearts where he is already, as a witness to our persecutors. I cannot deny that scripture calls us to “works” but the enthronement of Christ, whether it be in heaven or our hearts is not one of them. Otherwise if making Christ the Lord of our life, or making Christ anything is a “work” for the believer, than salvation is not by grace. Rather it’s only by grace that we could acknowledge Jesus as Lord. If that’s what is meant by “making” Jesus Lord I could write the difference off as a poor choice of words. But words mean something and poor word choices confuse or mislead innocent people, so “making Jesus Lord” is not the message of the gospel. I get it. Unfortunately semantics is getting in the way. Jesus of course is the King of all creation. So how could “anyone” make Him that which He already is? We didn’t make Him the King of all. Now having acknowledged that point(which I believe you are making…correct me, if I am wrong), then we can bow before Him now, in this life, and follow Him as our Lord and Savior, or bow before Him later, which all creation( believers and unbelievers will someday do). Scott, do you know of anyone who believes as you are suggesting, that when the Christian submits to the Lordship of Christ(which in all Christian circles I know of “making” Him Lord means), would ever conscience the idea that they are creating Christ’s Kingship…that they are personally responsible for delivering Christ’s thrown to Him, seating Him, through their submission to Him, on the right hand of the Father, which has already happened? Think about that. Jesus is already seated in Lordship and Kingship at the right hand of the Father(Acts 2:36, Rom 8:34, kmp 16:19). He is already King, therefore this concern of yours, IMO, is moot. . . . . participates in the sacraments (John 3:5, John 6:53). First, he left out two of the three most important qualities for a Christian. Secondly, if you love the Bible that is idol worship. Ok, I’ll bite, what are the two?